// Dr. Johnson's got a blog. In its continuing (and so far successful) quest to make me the happiest little bookworm netizen that ever was, the Beinecke has begun posting a definition a day from Johnson's great Dictionary of 1755. It's in honor of Johnson's tercentenary. I have thus far enjoyed learning that that oddly syllabified "ABA'CKE" means "backwards" (though it was already obsolete according to Johnson), and that "ABRO'ACH" means "to yield the liquor contained." But more than that, I love seeing the images of the pages. So make 'em high(er) res! 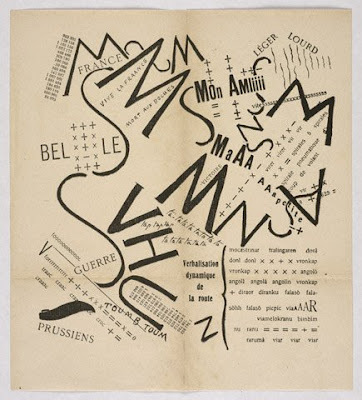 // Speaking of typography, another exhibit from the Getty archives, this one on the Italian Futurists. Only a handful of images are up, but it's a nice collection of seminal works not only for art and design, but also for poetry!